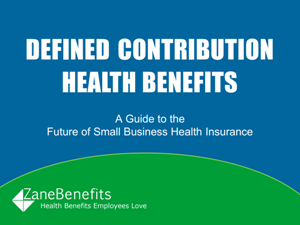 Zane Benefits, the #1 online small business health benefits solution, announced today the re-release of its flagship health benefits resource "A Guide to Defined Contribution Health Benefits for Small Business." The updated presentation helps small business owners, HR managers, and insurance professionals understand why defined contribution health benefits are the future of small business health insurance. According to Zane Benefits, less than 50% of small businesses offer group health insurance, primarily due to cost. Defined contribution health benefits offer a new solution for offering health benefits, and are gaining in popularity. Rather than paying the costs to provide a specific group health plan benefit (a "defined benefit"), employers can fix their costs by establishing defined contribution health benefits. Small business owners, non-profits, CEOs, CFOs, HR managers, and insurance agents should download this presentation to learn why defined contribution health benefits are the future of small business health insurance.